The 26th annual Smoky Mountain Winterfest kicks-off November 10th at Patriot Park in Pigeon Forge. Children’s games begin at 4 P.M., followed by live musical entertainment at 5 P.M. By dusk, over five-million Winterfest lights will be twinkling all over town! Sevierville will begin its celebration on Nov 9th, while Gatlinburg will celebrate on Nov 11th. The Winterfest lights will be on display through February of 2016. In addition to the Trolley Tour of Lights, this year the City of Pigeon Forge is offering a Winterfest Lights Driving Tour. This tour allows you to enjoy the light displays at your own leisure from your own vehicle. 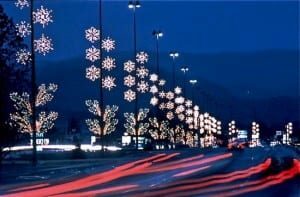 A Guide for the Driving Tour that provides more information on the light displays and historical information can be obtained at the Pigeon Forge Welcome Center at traffic light #0.